Different from other Deschutes Public Library Branches, the Friends’ BOOKSHOP in the Redmond Library is a fully functioning, 1000 square foot used bookstore space. Inside the Friends’ BOOKSHOP volunteers’ sort, shelve and sell “Like New” and used books in a variety of subject areas for public consumption! The books that make it to the shelves are always in good to excellent condition. •	Are you looking for that new mystery or romance novel . . . search no farther? •	Need a book for your literature class . . . check out what’s on our shelves? •	New book donations arriving weekly! The FORBL Bookshop is open five days a week and our hours are: Monday, Wednesday - Friday: 10:00 AM to 4:30 PM and Tuesday: 10:00 AM to 7:30 PM. Closed Saturday and Sunday. Now, the Friends are adding art, art prints, cards, magnets and bookmarks to what will be available at the FORBL BOOKSHOP. Beginning August 28 and continuing until November 6, 2018, members of the FORBL Art Committee will be displaying framed photographs, paintings and Limited Edition Art prints for sale along with bagged art prints and photos, cards, bookmarks and magnets of some of their favorite images. 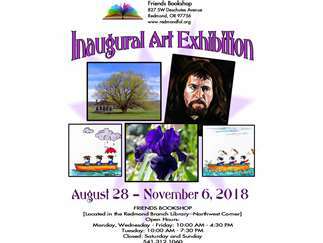 The Friends Art Committee includes well-known and award-winning artists and photographers from throughout Central Oregon. This committee was originally formed to display art in the Redmond Library and was known for their professionalism. Members include, Gillian Burton, Shari Crandall, Shandel Gamer, Kay Larkin, Joan Ouchida, Linda Shelton, Jill L. Tucker, Gary Wing and Linda Ziegenhagen. Come by the Friends Bookshop after August 28th and view the “Inaugural Art Exhibition” by these amazing artists. Remember, a percentage of all book and art sales help to support the Redmond Branch Library. The FORBL is a 501 c-3 non-profit located in the Redmond Library at 827 SW Deschutes Ave., Redmond, OR 97756. For more information visit the FORBL website at: www.redmondfol.org or call 541.312.1060.